"Get out of my way, I'll make you look like a genius." Maybe you can sometimes get too close to a piece of material, and lose the forest for the trees�that certainly seems to be the case here, because the historical circumstances on which the film is based are grisly and fascinating, the assembled talent level is high, and much of this is stylishly made, yet somehow the finished project is rather a disappointment. At times you think that it may be overly ambitious structurally; and when you learn about the personal connection to the story of the film's director, it becomes even more of a mystery that the whole project is a bit emotionally distant. The film is bifurcated, and pretty clearly to its detriment�half of the focus is on the killers, and the other half on the cops who pursue them. 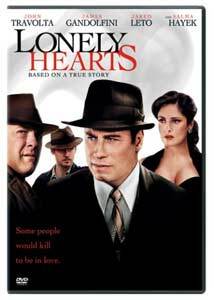 The lead investigator on the case is Buster Robinson, played by John Travolta�he's a man with his own dark secrets, for in a prologue we see his wife kill herself, leaving her husband and their son with nothing but questions. It's clear that we're supposed to connect the psychological dots: by pursuing this killer of women, somehow Buster is going to exorcise his own demons about his wife's death. The character is kind of a paler version of Bud White from L.A. Confidential, and the overall composition of the movie shares many similarities with Hollywoodland. But we continue to get the sense that Travolta is phoning it in, that he hasn't quite figured out this guy and his secrets, giving instead kind of a generic Troubled Cop performance; it comes as even more of a surprise when you learn that Todd Robinson, who wrote the screenplay and directed, is in fact the grandson of Buster Robinson, and that Buster's angst-ridden teenage son Eddie is the director's father in adolescence. The director does better with the exterior life of the picture than the interior ones of his characters�it's in the same vein of a movie like Mullholland Falls, in being a little too much in love with the dresses and hats and cars of the period, though having grown up on Long Island, I appreciated the sense of respect and nuance that the film has for the towns of Nassau County. Riding shotgun with Buster is his longtime partner Hildebrandt, played by James Gandolfini, who of course is a hypnotic presence, but at this point hadn't yet entirely thrown off the shackles of Tony Soprano�he's on the other side of the law, but a lot of the moves (and the accent) are much the same. Laura Dern may be the most moving presence in the film�she works in Buster's precinct house and sees him on the sly, though everybody knows it; you can see that she's in love with him, and is just waiting for him to beg her to stay, even though we all know that he can't and won't. You come away wishing that we could have empathized with more characters here in this same sort of way. Image Transfer Review: An impressive transfer, preserving the period feel and the attention to detail, with only occasional print scratches. Audio Transfer Review: A crisp and moody 5.1 track, with appropriate balance between all channels. Extras Review: The only extra of note is a making-of piece (11m:43s), featuring interviews with Travolta, Gandolfini and other cast members (including Leto, discussing having to shave the top of his head for his character's receding hairline); producer Boaz Davidson; and writer/director Todd Robinson, discussing both the project and his family history with this story. Despite the personal connections between the filmmaker and the story, the movie is oddly emotionally remote�elements of noir, police procedural, and cinema vérité don't ever really cohere.